Earlier today we reported on Crimson Dragon's move to the Xbox One and the Kinect controls being rendered optional, so I'll skip over that stuff. Andrew and I both got our hands on the demo at Microsoft's booth, and I'm here to tell you all about it. It's the future, and humans have colonized another planet. Sweet! But living on that planet causes a horrifying disease! That's bad! Well, certain people aren't killed by the disease, and that gives them the ability to ride dragons. I'd say the risk is worth it. In any case, Crimson Dragon is the spiritual successor to the old Panzer Dragoon series from the Saturn and original Xbox. In fact, the last time we saw a Panzer Dragoon game was ten years ago. That's a long time to go without a dragon-based rail shooter. As mentioned, Crimson Dragon is now an Xbox One title and uses either the regular controller, or the Kinect if you absolutely must make things harder for yourself. The dragon we controlled in the demo has the classic lock-on attack and an electricity-based beam attack that fires wherever you point your reticule. You're still on rails, though you have the freedom to move around the screen or dash to your left or right to avoid incoming projectiles. You'll fight scrub enemies, other dragons that appear to have the same mobility as the one you control, and of course, gigantic boss creatures. The one we faced in our demo time was an enormous fire serpent swimming and leaping through pools of lava. 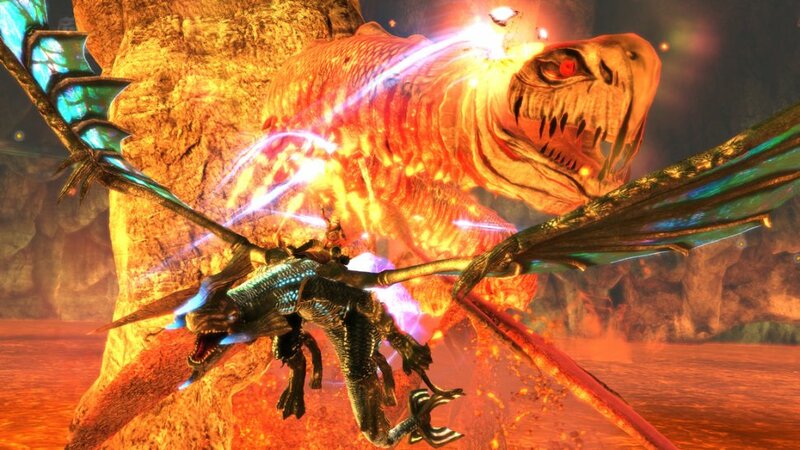 After you beat the serpent and the miniboss dragon that follows it, the demo ends by revealing an absolutely gigantic white dragon who presumably proceeds to eat your face. Unfortunately, that's where our time ended and I'm left wondering about the fate of my character until then. The controls felt nice, and the jump from a 360 controller to an Xbox One controller wasn't exactly a huge change. I had a little bit of an issue with losing the reticule among the action, something the studio rep on hand said was a known issue and was being worked on. Otherwise, the dragon controlled fast and fluid. The only problem was my inability to dodge as effectively as I should have been. It wasn't on display in the demo, but apparently there are many other dragons beyond the one we were shown today, and you'll be able to customize them using items earned through gameplay. Sounds good to me. When the Xbox 360 version of Crimson Dragon was announced, three-player online co-op was also mentioned. The game still has co-op, but the player count is currently in flux. We do know that it remains online-only.